The mining industry is facing growing pressure to improve its current practices and to develop environmentally-friendly processes to reduce current and future environmental liabilities. Several mining jurisdictions around the world have banned or restricted the use of cyanide. As a consequence, mining companies are struggling to obtain the project permits due to increasing environmental and social concerns related to the use of cyanide. The DST process provides mining companies with an alternative to the conventional methods of extracting gold with cyanide. The toxicity of cyanide and the environmental challenges related to this reagent are well documented. The method used by DST uses no cyanide, produces no toxic liquid or gaseous effluent, and the solid residues are inert, stable and non-acid generating. DST’s chlorination process uses sodium hypochlorite with a catalytic amount of sodium hypobromite in acidic conditions to put the gold into solution. Contact time is short, and the process operates in a closed loop. All chemicals are recycled within the circuit and, sea water is also suitable where available. Depending on the nature of the mineral, pre-treatment may be required prior to the gold extraction step by chlorination. When dealing with sulphide bearing ores or concentrates, controlled oxidation is required as a pre-treatment prior to chlorination. 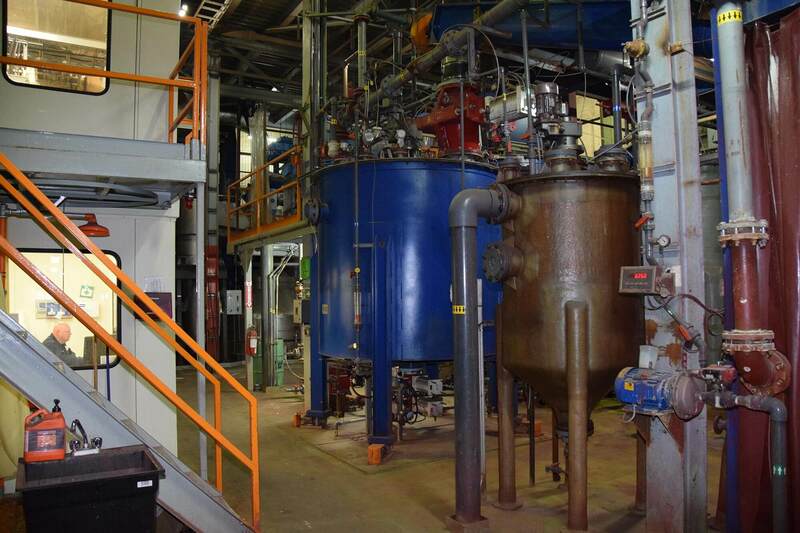 Controlled oxidation is performed by introducing materials into a fluidized bed, with a controlled air supply, to volatilize certain components such as sulfur, while retaining the porous character of the solid fraction. The gases that are produced by this operation are first passed through a dust collector where the particles are recovered and recycled into the fluidized bed. The gases are then routed to a wet scrubber circuit, where the sulfur compounds are transformed into a sulphuric acid by-product. If the oxidized mineral contains base metals that need to be recovered, such as copper, a water or acid leach is carried out prior to the gold extraction step. In fact, if the operation conditions of the controlled oxidation predominately lead to the formation of copper sulphates, a water leach, instead of an acid leach with sulfuric acid, can be performed. Following the filtration of the water or acid leached slurry, a copper sulfate solution can be fed to a solvent extraction and electrowinning plant (SX/EW) to recover the copper. The water or acid leached cake is then fed into a reactor where it is contacted with sodium hypochlorite, with a catalytic amount of sodium bromide, in acidic conditions to solubilize gold. The contact time is short, 1 to 2 hours versus 2 days for cyanidation. Once the reaction is complete, the slurry is filtered, leaving an inert, stable and sulphide depleted solid residue. The gold containing brine is sent to an agitated vessel where the oxidation-reduction potential (ORP) of the solution is reduced, which leads to the gold deposition onto silica. The solution is filtered, and the gold loaded silica, which may contain up to 30% of its weight in gold, is then fused to isolate and collect the precious metal. The silica slag is ground and re-used in the circuit. 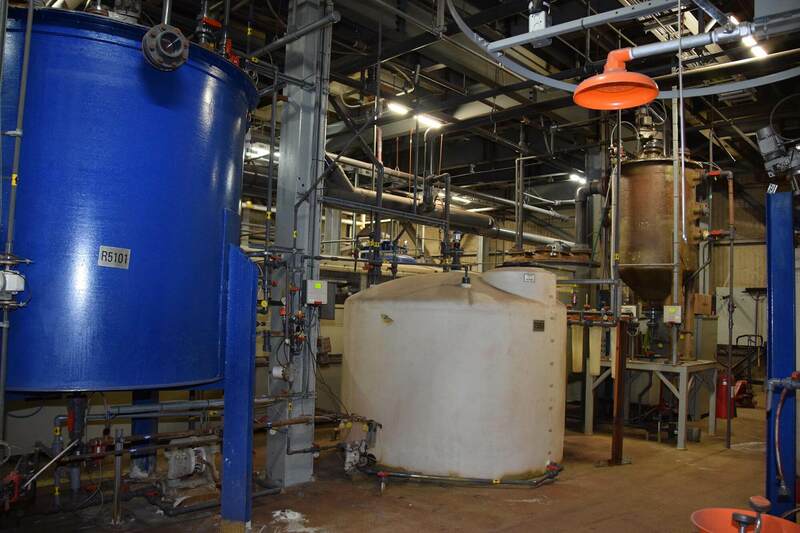 The process operates in a closed loop, with the gold depleted brine undergoing different polishing steps prior to being sent to membrane-less electrolysis cells, to regenerate sodium hypochlorite for reuse in the process. The DST process creates no liquid effluent which is unlike the cyanide process that requires significant wastewater handling and treatment. Therefore, any industrial plant operating with this technology will not have to keep an inventory of chlorine gas on site. Moreover, the usage of hypochlorite instead of chlorine gas greatly simplifies the safety features and risk related to a large continuous operation. Over the past 10 years, hundreds of samples from around the world have been tested at the laboratory scale with DST extraction technology using chlorination. In most cases, over 95% of the gold was extracted and in all cases, the gold extraction yields were equal or superior to those obtained from conventional approaches. The superior results at the laboratory scale justified the optimization of the technology at pilot scale. In 2010, the company undertook the construction of a pilot installation and built a team of professionals to support the development of this technology. Following successful piloting campaigns in 2012, the construction of the first, fully automated industrial demonstration plant using DST’s chlorination technology, was completed in 2015. The plant is located in Thetford Mines, Quebec has a capacity of fifteen tonnes per day of mineral concentrate. Through a first demonstration campaign, completed in early 2016, DST processed a total of 170 tonnes of a gold and copper bearing refractory pyrite concentrate from a region where the use of cyanide is restricted. The program demonstrated that the DST process had an average extraction yield 14% higher than cyanidation, with results of up to 90% gold recovery. A second demonstration campaign, was successfully accomplished on a complex gold concentrate from Chile using DST’s proprietary chlorination technology in December 2016. DST processed 40 tonnes of this complex material which is difficult to process using conventional processing methods without the associated environmental liabilities and metallurgical challenges. 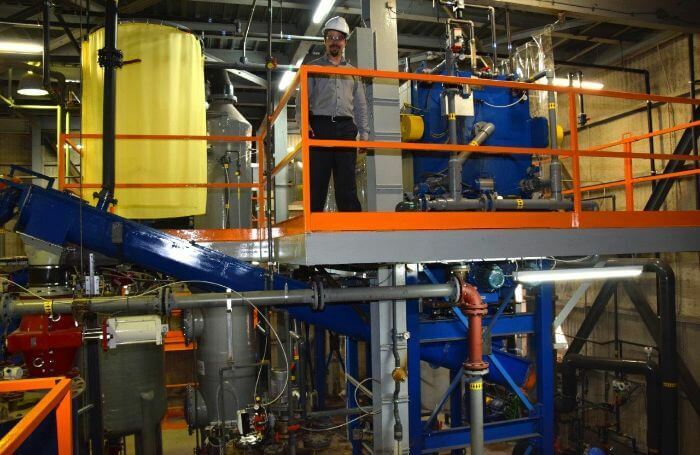 The demonstration campaign has successfully demonstrated the amenability of this gold and copper concentrate to be processed efficiently at an industrial scale using the DST chlorination process. Oxidation of this concentrate removed 99.4% of the sulphides and 98.7% of the mercury, leaving residues that are non-acid generating. An average gold extraction yield of 94.9% was achieved at the outlet of the chlorination reactor with full environmental control over the residues and atmospheric emissions. 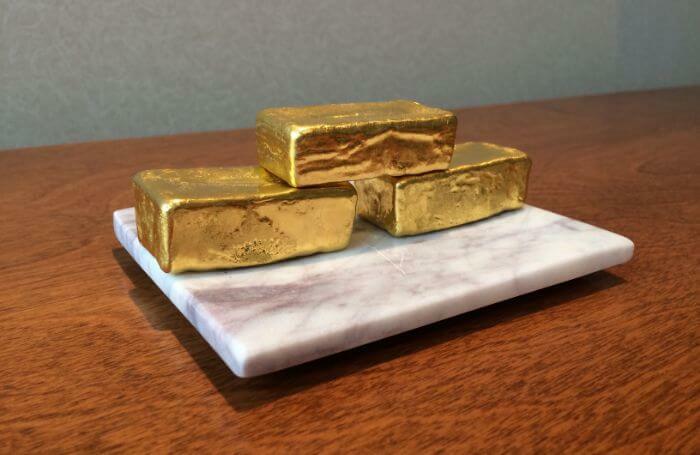 The gold deposition yield was over 99.5%, leading to an overall gold extraction yield of 93.6% through the process. The Company has received, from Environment Canada, through the Canadian Environmental Technology Verification Program (“ETV”), an independent certification of the performances of its cyanide-free gold extraction process. Where, a total of 170 tonnes of gold bearing refractory pyrite concentrate were processed, all solid residues met environmental norms and DST’s chlorination circuit delivered the anticipated gold recoveries which were higher on average than cyanide yields on same samples. In addition, the process successfully demonstrated its closed-circuit operation with the recycling and regeneration of the reagents. “The performance claims of Dundee Sustainable Technologies’ “Cyanide-Free Gold Extraction Process” is verified by Canadian Environmental Technology Verification (or Canadian ETV)”.